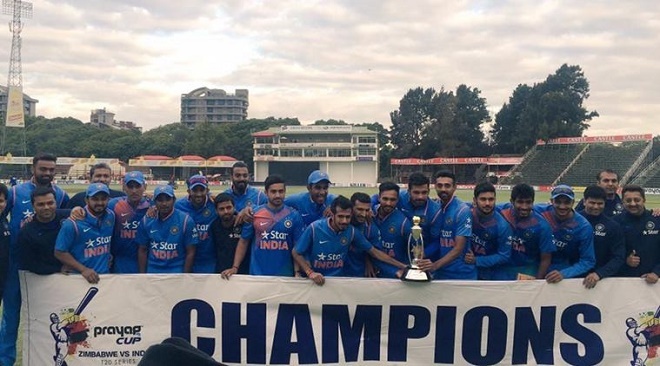 India won the series by 2-1 over Zimbabwe after winning 3rd T20I by just 3 runs and Zimbabwe show good fight against India in T20 Series after white wash in the ODI series. They even won first T20 against India and India not able to score 8 run in last over that shows the bowling strength of Zimbabwe as their coach Ntini said, they had good bowlers but their batsman has to take responsibilities. In 3rd T20I Zimbabwe won the toss and elect to bowl first and it was first time that India bat first in both of the series and their bowler did well after sending both opener back in the hut and all are fallen cheaply butÂ to Kedar Jadhavâ€™s fifty and some good hand by Axar in the end India will reach to target of 138. Chasing 139, Zimbabwe looked in control halfway through the chase but failed to bring home the victoryÂ thanks to Â two wickets each from Barinder Sran and Dhawal Kulkarni. Although Zimbabwe lost both openers cheaply, Vusi Sibanda and Peter Moor steadied the ship and set the platform for the hosts. But once Sibanda fell, things started to unravel. As the target grew closer, the hosts became more nervy. In the end, needing 21 runs from the last over and Barinder Sran bowling it, their chances looked slim. But a no ball and a free hit meant they had a chance but they ultimately fell four runs short of the target. Indian captain MS Dhoni said: "What happens in this format is the games get close. Zimbabwe batted, bowled and fielded well in this series, which is why it was a close series. As the format gets longer, it will be difficult for them to compete. They need more games to get better and better. â€œI didn't get a chance to bat but I felt it was the right way to play cricket - having opted to bat. Fast bowling is something you need a good pool for. We have 10-12 bowlers now who can play limited overs cricket. Gradually they will graduate to the Test level. Games like these will help them mature, and the fact that we lost the first T20I helped us get more out of the series."